The Department of Planning, Transport and Infrastructure captures data and information that is considered by the state planning system, capturing changes in people, environment and urban form to provide all levels of government, industry and the community with the South Australian context that guides decision-making. Click the boxes below to view snapshots, graphs and maps that summarise this data. 75% of new dwellings built in Metropolitan Adelaide are detached houses1. 77% of housing in Metropolitan Adelaide also comprises three or more bedrooms2. In recent years, changing lifestyle choices and an ageing baby boomer generation have resulted in increasing trend towards alternative housing choices such as row houses, terrace houses, units and apartments. Planning reforms introduced in 2012 and 2013 to metropolitan Adelaide have seen a 400% increase in apartment approvals and a 60% increase in apartment sales3. Currently, 61% of households contain only one or two persons3. Lone person households are the fastest growing household type and by 2031 are projected to increase by 44%4. We will support an increased trend towards alternative, 'missing middle' housing choices close to services and public transport to provide all South Australians access affordable living regardless of household type, life stage or lifestyle choice. Greater Adelaide offers the second most affordable housing of any Australian capital city with a median dwelling price of $426,0001. Greater Adelaide also offers affordable living options in areas close to high frequency public transport options. The middle ring of Greater Adelaide offers averages a total $924,000 20-year cost per household2. 40% of homes within Greater Adelaide are within 800 metres (10 minute walk) of high frequency public transport3. 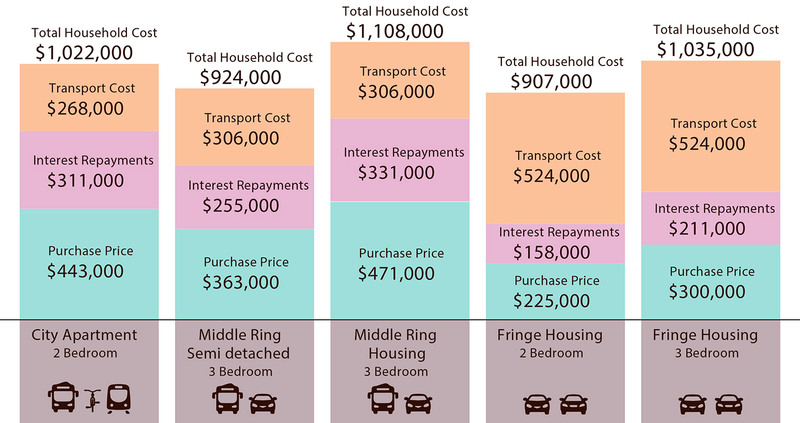 While Adelaide has a housing affordability advantage compared to other states, it is important to maintain living affordability in parallel as the costs of living extend beyond the purchase cost of the home to include transport, services and utilities costs. Transport costs are the second largest component of household expenditure and can be significantly higher for people living in the outer metropolitan areas compared to those living in inner and middle rim suburbs. Quality public open spaces connect people with nature, encourage walking and cycling, and are great places for people to meet and enjoy. 77% of residents in Greater Adelaide live within 400 metres (5 minute walk) of public open space that is greater than 4,000m²1. The Adelaide CBD is surrounded by 930 hectares of Park Lands which are the largest urban park system in the nation2. The State Government have committed $20 million over four years for Park Lands revitalisation projects to ensure the Park Lands are attractive, diverse, resilient and vibrant for existing and future communities that surround them. As living and housing choices in Greater Adelaide change, the role of public open space becomes more important as more people choose to live in places with smaller backyards such as apartments or units. Ensuring access to quality green spaces and places for recreation, health and wellbeing is vital. The Adelaide Park Lands will become the new backyards for people living along the city’s edge and will support an increased population in the city. Streets represent approximately 80% of public open space in modern cities and must be recognised as destinations for commercial activity and social interaction, not just as transportation routes dominated by cars3. Green infrastructure is essential on streets to prioritise people instead of vehicles. Active travel to destinations is a convenient, accessible and highly effective way to integrate exercise into the work day. Active travel includes walking, cycling, skating and skateboarding. Public transport can also be included if the method of travel to the station or stop was by active travel and not a private vehicle. 80% of travel in Greater Adelaide is made by private vehicle use as either a driver or passenger. Currently, 14% of people in Greater Adelaide use active travel methods in their journey to work1. 72-75% of people in Greater Adelaide have a trip destination within the same area from where they start, averaging a short trip distance of 3-6 kilometres. The average person is expected to be able to cycle this distance in 9-18 minutes2 which is a perfect opportunity to utilise active travel. Active travel saves the Australian economy $1.43 billion a year, providing a benefit of $1.43 for every kilometre cycled and $2.12 for every kilometre walked3. There is great potential for increasing active travel modes in the Greater Adelaide region, particularly in areas close to the city and/or high frequency public transport options. Replacing car use with active travel reduces congestion on our roads, improves air quality and significantly reduces individual transport costs. 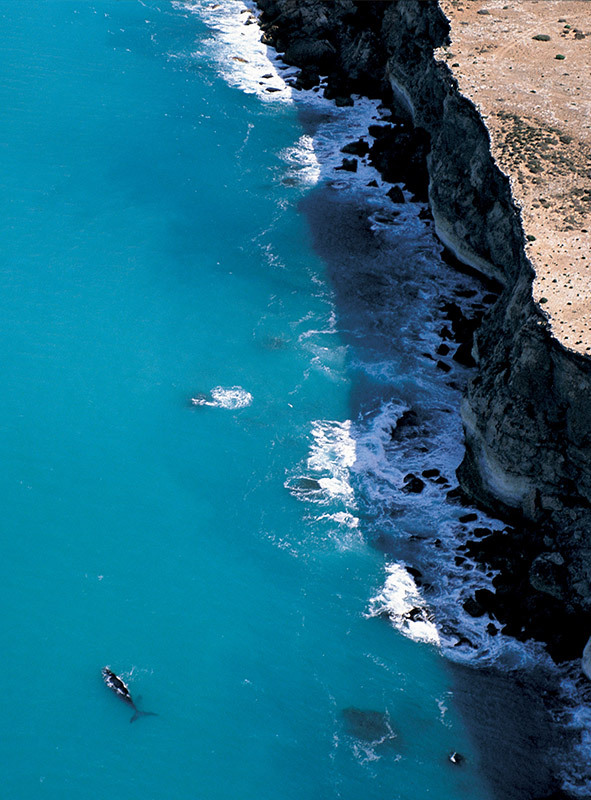 There are approximately 1.7 million people living in South Australia. Over the five years to 2016, South Australia's average annual growth rate has been 0.9% (approximately 14,700 people per year). 83% of South Australians, some 1.4 million people, live in the Greater Adelaide Planning Region1. South Australia’s population is projected to reach 2 million people by 2036. 96% of this growth is projected to be in the Greater Adelaide Planning Region. We will continue to attract international and interstate people to live, work and play in South Australia to continue to support our state economy. Between 2010 and 2015, 76% of new dwellings in the Greater Adelaide region were built in existing built-up, infill areas rather than on broadhectare land on the fringe. This met our 2010 30-Year Plan for Greater Adelaide target for infill development earlier than expected1. Infill development in the inner and middle suburbs of Adelaide encourages greater use of our public transport system, utilises existing infrastructure and generates more jobs than building new homes on the fringe2. 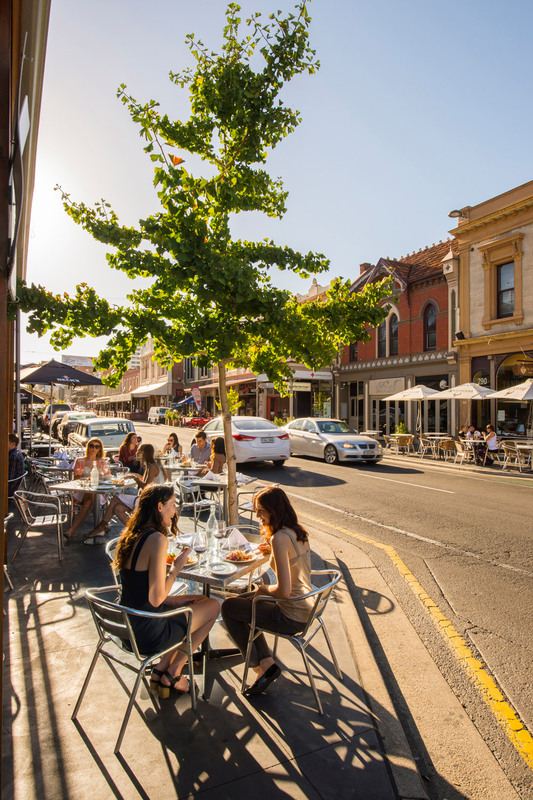 Areas in Adelaide with higher population densities are some of our most vibrant and liveable communities such as Unley, Prospect, Glenelg and Norwood. We will continue to encourage growth within our existing urban footprint as infill development with convenient access to public transport. We will also encourage diverse housing types to provide equal opportunity to all South Australians. Adelaide City is ranked as one of the most liveable cities in the world and has been ranked fifth globally for three years from 2012-20141. Recent initiatives in Adelaide City have seen it reinvigorated as the vibrant heart of South Australia. South Australia’s small venue liquor license introduced in 2013 has rejuvenated city laneways such as Leigh Street and Peel Street. Since the new licenses were introduced, over 70 new businesses have opened and a nationally recognised small bar scene has been established2. Healthy, walkable neighbourhoods are where the daily needs of most residents can be met within a short trip of where they live or work, accessible by foot, bike or public transport. Currently, 52% of the population of Greater Adelaide live within walkable neighbourhoods with close access to jobs, shopping, learning, open space, recreation, and other amenities and services1. Tree canopy cover is an essential part of a healthy neighbourhood and people who live in with a higher density of trees on their streets perceive themselves to be significantly healthier and have fewer cardio-metabolic conditions2. Greater Adelaide has an average tree canopy cover of 27.28%3. Creating communities where people can live nearby to their daily needs is essential to supporting increases in walking, cycling and public transport. To create vibrant neighbourhoods we will ensure there are enough people to support local shops, services, public transport and community facilities within walking distance. The increased presence of people gathering, walking, or riding bikes on streets helps to improve the amenity value of these spaces and increases feelings of personal safety or security. 3 - Institute of Sustainable Future, University of Technology Sydney (2014), National Benchmarking Report. Adelaide Metro provides extensive public transport options across Greater Adelaide on a train, tram and bus network. The average population density in Greater Adelaide is 1,400 people per km² which is among the lowest in Australia. Research shows that cities around the world with well-utilised public transport networks have an average population density of at least 3,000 people per km² across metropolitan areas1. To support new public transport investment, we will concentrate Greater Adelaide’s population growth close to existing and planned public transport routes to increase population density around them. Increased density around public transport can also be achieved by allowing a mix of land uses, improving building design and prioritising walking and cycling infrastructure. South Australia has the second oldest population in Australia with a median age of 40 and 18% of the population aged 65+1. By 2041, this cohort of South Australians is projected to increase by 170,000 people and account for 23% of the population2. 59% of net interstate migration losses is comprised of 20-39 year olds which also contributes to an ageing population3. We will provide greater housing and transport choices to suit the changing needs of our population and provide incentives for young people to stay, live and work in South Australia. Sports and recreation contributes more than $1 billion to the South Australian economy, including a $643 million health benefit and $271 million volunteer contribution1. The most popular physical activity in South Australian adults is walking, while the most popular physical activity in South Australian children is swimming2. An average adult requires 150-300 minutes of moderate physical activity a week to sustain a healthy lifestyle3. We will ensure neighbourhoods provide diverse, quality public open space that encourages communities to have active, healthy lifestyles. Public open space will become particularly important as we seek to attract more people to live within our existing urban areas. Private car use dominates the travel choices of South Australians and makes up over 70% of all South Australian passenger kilometres travelled1. Cars especially dominate commuting trips, with over 80% of work trips in Adelaide made by private car, the highest of all Australian capital cities2. In the last ten years, the proportion of the population aged 65+ with a license has increased by 10.3%3. We will aim to reduce our car dependency for short trips by supporting convenient alternative transport options such as public transport, walking and cycling. Higher density housing and mixed-use development will help increase access to local destinations that are within walking or cycling distance such as shops, services, recreation spaces and public transport. 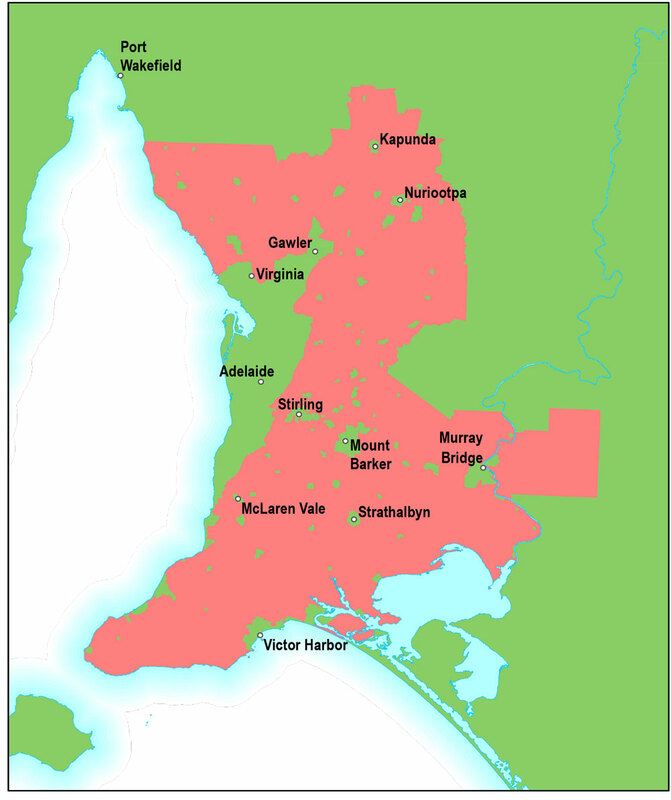 The Greater Adelaide planning region stretches from Victor Harbor to Kapunda and includes an area of approximately 9,000 km². 84% (1.4 million people) of South Australians live in the Greater Adelaide Planning Region and by 2031, 97% of South Australia’s population growth is expected to occur here1. Greater Adelaide is South Australia’s engine room, contributing more than 80% of the State’s Gross State Product (GSP)2. There are 523,000 jobs in Greater Adelaide which accounts for 73% of South Australia's workforce3. We need to plan for significantly more people, dwellings and jobs in Greater Adelaide to support South Australia’s future growth. Planning reforms introduced for Metropolitan Adelaide in 2012-13 have unlocked new investment, stimulated new housing and improved design outcomes. Since 2012, more than 100 potential development projects to the total value of more than $4 billion have been unlocked in Metropolitan Adelaide1. The state planning system provides planning decisions for new development across South Australia and can therefore influence economic outcomes and employment growth. We will continue to remove unnecessary red tape, accelerate the planning decision process and ensure that regulations support opportunity. The new Planning, Development and Infrastructure Act 2016 (PDI Act 2016) legislation will continue to unlock investment and stimulate the South Australian economy. In recent years, the amount of broadhectare land consumed for new dwellings has lessened. Between 2010 and 2015, 76% of new dwellings in the Greater Adelaide region were built in existing built-up, infill areas rather than on broadhectare land on the fringe1. There is currently over 20 years' worth of zoned land available for future growth from the combination of broadhectare land and significant infill areas in the Greater Adelaide region2. We will continue to encourage new development within built-up areas to avoid urban sprawl, incur less transport and infrastructure costs for South Australians and support South Australia’s long-term growth. Across Australia, economic activity is shifting away from goods-producing manufacturing and towards technology, knowledge and service industries. 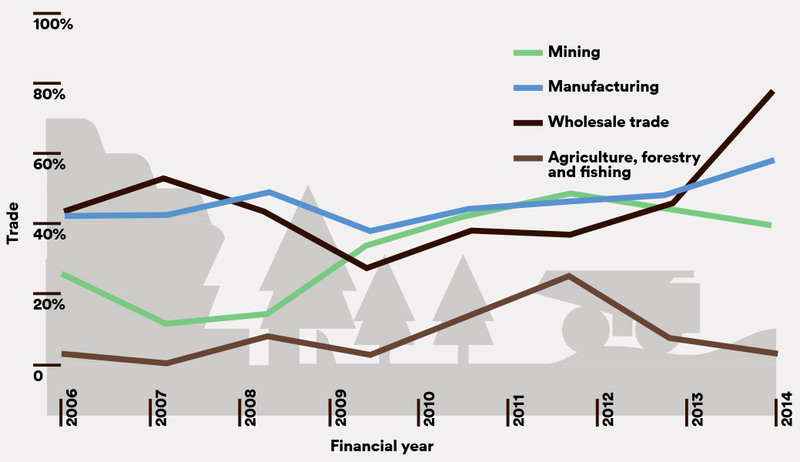 There has also been substantial growth in new industries such as renewable energy, education and clean technology. A new global focus on autonomous travel will fundamentally change the way we move around and car ownership. The health care and social assistance industry has grown by 28% over the 10 years to 2016 and accounts for 15% of all South Australian jobs1. The new $3.6 billion Health and Biomedical Precinct on North Terrace in Adelaide City will further support this growing industry and the New Royal Adelaide Hospital will provide 6,000 jobs2. To ensure our economic competitiveness, we will embrace new industry trends and technologies and adapt the structure of our city and its transport system in response. There is enormous potential for our premium food and wine production to grow through unlocking renewable energy and technology industries. Employment areas need to be flexible – more housing needs to be located in close proximity to the city and activity centres and public transport needs to connect people with jobs. Sufficient strategic employment land options with direct access to major freight routes will be provided to support future employment. Exports from South Australian sea ports have been increasing and play an important role in South Australia’s economy. 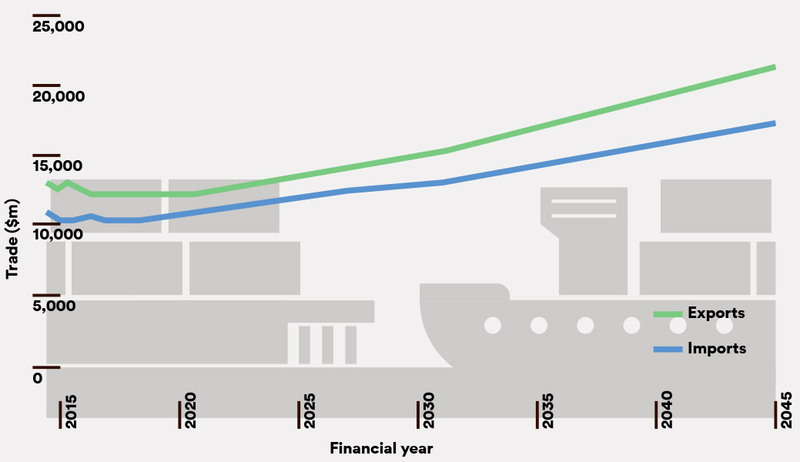 The heaviest export users of South Australian ports are the mining, manufacturing, wholesale trade and agricultural industries, and both agriculture and mining are expected to grow significantly over the next thirty years1. The naval shipbuilding industry expansion and construction of twelve new submarines in Osborne will increase the use of ports and maritime facilities in Greater Adelaide. The South Australian Government also plans to increase the number of cruise ships calling into South Australia from 32 to 43 by 20202. Adelaide Airport has one of the highest job densities in South Australia. The airport provides over 17,000 jobs, contributes $1.944 billion to Gross State Product (GSP) and represents 2.1% of the State’s economic activity3. The airport is currently planned for a $1 billion upgrade over five years to provide 3,500 more jobs4. We will continue to accommodate increased growth in our state’s ports by protecting current and future road and rail corridors and providing sufficient land for industry expansion. In 2013-14, the agriculture, forestry and fishing industry contributed over $17 billion to the South Australian economy and accounted for more than 40% of our merchandise export. South Australia is also the premier wine state of Australia and produces 65% of all Australian wine exports1. By 2050, the world demand for food is projected to rise by 70% which will place pressure on the South Australian food bowl, environmental and agricultural production areas and economy2. We will continue to encourage new development within our existing urban footprint to limit urban sprawl, to preserve valuable agricultural lands and protect our food bowl for future generations. The Environment and Food Production Areas (EFPAs) have been introduced as part of the new Planning, Development and Infrastructure Act 2016 (PDI Act) to protect these valuable lands. South Australia is vulnerable to changes in temperature, extreme weather events, sea level rise, and associated storm surges. Greater Adelaide’s average number of hot days above 35 degrees Celsius is predicted to increase by up to 47 days per year by 20701. Good urban planning can help us cope with the impacts of climate change. In Greater Adelaide, a compact urban form integrated with more transport options will help to reduce our reliance on cars and reduce greenhouse gas emissions. Increasing our urban tree canopy and retaining water in urban landscapes can help reduce the urban heat island effect. Improving the design and thermal efficiency of new buildings can also help to reduce energy consumption, energy cost and the overall cost of living1. While every effort has been made to ensure data is correct, up-to-date and consistent, DPTI gives no warranty in relation to the data and accepts no liability for any loss, damage or costs resulting from the data being inaccurate or incomplete in any way and for any reason.